Obituary for Betty Ann Karrick | Powell Funeral Home, Inc.
Miss Betty Ann Karrick, of Cardinal Drive, Mount Sterling, KY, passed away Sunday September 23, 2018 at Windsor Care Center in Mount Sterling, KY, at the age of 82 years, 11 months and 28 days. Miss Karrick was born September 25, 1935 at Salt Lick, KY, a daughter of the late Travis and Marjorie Kimbrell Karrick. 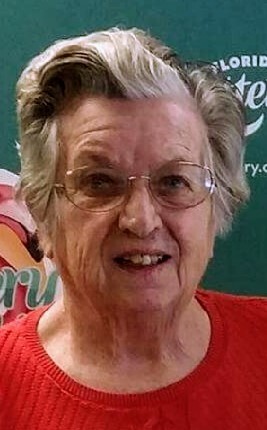 She was a retired teacher and administrator in Florida and Kentucky including the Mount Sterling and Montgomery County School Systems. She was a graduate of Mount Sterling High School and Morehead State University. She was also a member of the Kentucky High School Athletic Association Hall Of Fame, Morehead State University Alumni Hall Of Fame and Delta Kappa Gamma International Society For Outstanding Women Educators. In addition to her parents, she was preceded in death by a brother, Bill Karrick. Survivors include her twin sister, Nan K. Ward of Mount Sterling, KY, a nephew, Jim Ward and his wife Wendi, a great-nephew, Matthew Ward and two great-nieces, Sarah Heinvetter and her husband Markus and Anna Lathers and her husband Jake. Funeral services will be conducted Saturday October 6, 2018 at 10:00 AM in the sanctuary of Mount Sterling First Christian Church with the Rev. Scott Holley and the Rev. Michelle Ballard officiating. Interment with committal service will follow in Longview Cemetery at Bethel, KY. Serving as pallbearers, Michael Cord, James Martin Daughtery, Terry Ensor, Kent Evans, Eddie Ward and Matthew Ward. Visitation will be Friday evening October 5, 2018, from 5:00 PM – 7:00 PM at Powell Funeral Home, Salt Lick, KY and in the chapel of the Mount Sterling First Christian Church on Saturday morning October 6 from 9:00 AM until the hour of service. In lieu of flowers, contributions are suggested to the Karrick/Ward Athletics Enhancement Fund at Morehead State University, c/o M.S.U. Foundation, Inc., 150 University Blvd., Box 1887, Morehead, KY 40351.